phical center of Germany and neighbors five other German states. Due to its central location the region functioned early on as a vital hub of commerce and trade. It was in the “Free States” of Thuringia and Saxony where the industrialization of Germany started. Today, Thuringia continues this vital tradition but now attracts future-oriented technologies thanks to continuous reconstruction and reinvention. The city of Erfurt is Thuringia’s capital and well-known for its beautiful architecture. In terms of fame, though, Erfurt usually takes second place behind the city of Weimar, which played a pivotal role in German history. It was here that in 1919 the German National Assembly passed the Weimar Constitution. In German history, the quarter century between the two World Wars also bears the city’s name, the Weimar Republic (1919-1933). Thuringia is often referred to as the green heart of Germany, a title which the state owes in part to the famed Thuringian Forest, a destination popular with hikers and winter sports enthusiasts. 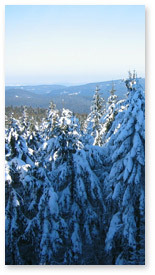 One of the most well-known hiking routes in Europe, the so-called Rennsteig, runs along the crest of the mountain range for a length of 168 km. The area is also home to Europe’s longest (400 km) sled dog race “Trans Thüringia.” The other reason why Thuringia is considered Germany’s green heart is because around half the state’s land is used for agriculture due to the high quality of the soil. Important crops are grains such as wheat and highly prized barley for brewing, sugarbeets, rapeseed and a wide variety of vegetables. Thuringia has also long enjoyed an excellent reputation for the processing of agricultural products into foods for human consumption. One thing Saxons and Thuringians can’t seem to agree on is the question of who invented the type of dumplings made primarily from grated raw potatoes. What people from both states would probably readily agree on is the old adage that a Sunday without dumplings just wouldn’t be a real Sunday. The regional love of dumplings is sometimes taken to such extremes that dishes which under normal circumstances would be considered the main dish or entrée are routinely downgraded to mere accompaniment status. To the true potato dumpling lover these round delicacies take center stage, and the meat dish served alongside the dumplings has the nice side effect of providing the gravy necessary to complete the meal. 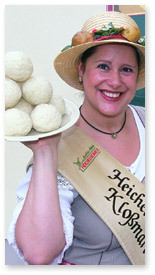 While the ingredients for Thuringian dumplings are very simple, the preparation is anything but. Therefore the recipes and even the names for the finished product vary from region to region, and the precise technique is often a well-guarded family secret. med, scalded, and cured sausages is truly astounding. While the taste and texture of the sausages also depends on the types of meat used (mainly pork and beef or veal, but also turkey or venison), the true character of the finished product is defined by the blend of seasonings which is every butcher’s well-kept secret. Some typical regional sausages are a dry-cured pork and beef sausage known as Thüringer Mettwurst, a steamed liver sausage (Leberwurst) and a very popular blood sausage called Thüringer Rotwurst. With all the variety available in this sauage-making hub, there is one type of Thuringian sausage which reigns supreme – Thüringer Rostbratwurst, or Thuringian grilled sausage. As is true for many other typical German specialties, this famous sausage also goes back to ancient traditions, with some sources dating the oldest recipe all the way back to 1404. 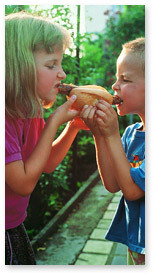 (In addition, the Thuringian Bratwurst Purity Law is the oldest German food purity law, dating to 1432. Read more about the Purity Law.) The main ingredient ofis lean pork from the shoulder or belly, with usually some beef or veal added. The finely chopped meat is seasoned with any combination of these herbs and spices – garlic, cumin/caraway, marjoram, sometimes even coriander and nutmeg. That mixture is then packed into hog or sheep casings and sold either scalded or raw. This goes to show that the production process of this seemingly simple food is actually quite complex and involved. True Bratwurst aficionados usually don’t take the preparation of the beloved sausages lightly either. The tricks range from a common practice of basting the sausages with beer to greasing the grill with bacon or pork belly fat. Despite these myriad ways of producing and grilling Thuringian sausages, it is generally agreed that the most authentic way of eating a Rostbratwurst is placed in a fresh bread roll (Brötchen) which is sliced in half but not all the way. While decidedly different in taste and texture, this grilling sausage is similar to their American cousin, the hot dog at least in its uncontested popularity. The best way to enjoy this quintessential Bratwurst is fresh and hot off the grill on a warm summer evening in the company of family, neighbors and friends. Believe is or not, Thuringia’s biggest food festival is the onion fair held in Weimar each year on the second weekend in October. Visitors to this food fair can sample many aromatic onion specialties, such as onion soups and stews, onion breads and tarts. 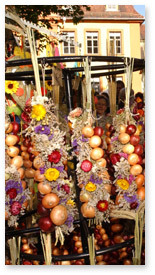 Vendors at around 500 booths not only offer fabulous onion dishes but also compete in selling the market’s signature trophy: decorative braids of onions. The fragrant bulbs are cleaned, sorted by color and size, and craftily twisted around a straw core. Dried flowers, herbs and sometimes heads of garlic are added to enhance the look of the braid. Each braid contains an average of 60 red and yellow onions. In 1995 the longest onion braid ever crafted for the Weimar market measured an unbelievable 17 feet and was suspended from the tower of city hall. The Weimar onion market looks back on a long tradition, going back to 1653 when farming families from the small onion-growing town of Heldrungen started carting their produce for 30 miles to Weimar’s market square.